Over the 20 years we’ve been manufacturing our products, we’ve perfected our packaging methods to insure your awards arrive in beautiful condition, ready for your event or occasion. There are two types of packaging for your awards, plaques and gift items: Individual Item Packaging, and Shipment Packaging. Individual Packaging: each plaque, award or gift item is packaged in its own box. Standard Packaging: Standard boxes come with most of our plaques, gift items, inexpensive and mid-range vases and bowls, and inexpensive glass and crystal awards. Standard packaging is typically a white trifold box. Upgraded Standard Packaging: we do offer an upgrade to a standard white packaging box, which is a black trifold box. This is an inexpensive opton for upgrading your award or gift, if a box is important to your presentation. 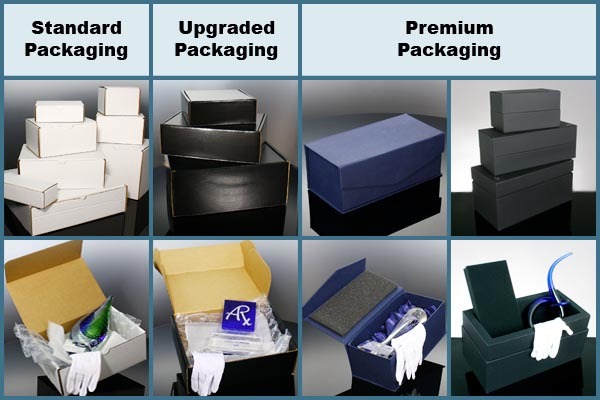 Premium Packaging: Premium boxes are generally available with our more expensive crystal and glass awards. Special Packaging: for many projects, our clients request special packaging. It might be for a special event, trade show, presentation, or meeting. You may want boxes in a special color, velvet lining, your logo on the box, gift wrapping, or other special requirements. We can help with any of these requirements, and many others that have come our way over the last 20 years. Shipment Packaging: all items are double boxed for shipment. Small shipments: once your awards, plaques or gifts are packaged in their individual boxes, they will be packaged for shipment. Each individual award box is carefully bubble wrapped and placed in a larger box for shipment. The size of the shipment boxes depend on the size and number of units being shipped. Large shipments: individual award packages are bubble wrapped and packaged in larger shipment boxes, and then palletized for shipment. This method adds an extra level of protection and insures that the entire shipment will arrive together. Grouping of particular award packages together for special presentation requirements (Perhaps there will be regional meetings with awards presentations, in addition to a national meeting with awards. If these events take place at the same location but on different days, we can package them separately to be delivered to a specific meeting room or location). Please contact us with any questions about packaging for your awards and gifts 800-753-3384.